It was with great sorrow that we learned last week of the passing of novelist and game designer Aaron Allston. Best known for his work on novels set in the Star Wars universe, Wolfe fans will remember him for his fine story “Epistoleros” in the recent Shadows of the New Sun collection. Many of the authors in that collection chose to write stories woven tightly into the story-space of Wolfe’s works, but Aaron chose to write a story that just felt Wolfean. He skilfully crafted a metafictional western in the epistolary style that examined the relationship between story and history. We recommend that you seek it out. I contacted Aaron about an interview for our series talking to the writers collected in Shadows of the New Sun. His health, writing, and convention commitments prevented us from completing the interview at that time. When I contacted him again I found that he had already written a comprehensive set of story notes about “Epistoleros” which answered many of the questions I’d hoped to ask him. We send our condolences and sad best wishes to all of Aaron’s family and friends. You can read “Epistoleros” in Shadows of the New Sun: Stories in Honor of Gene Wolfe edited by J.E. Mooney and Bill Fawcett, available from Tor Books. Judi Rohrig, Gene and Rosemary Wolfe, writer C.S.E. Cooney, and Bekah Rohrig (Li’l Pirate). 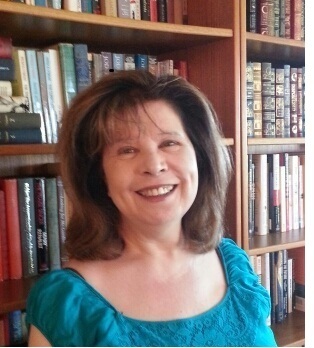 Judi Rohrig is a writer of fiction and non-fiction, and an editor who has been honored with the Horror Writers Association’s Bram Stoker Award (2004) for Non-Fiction (for editing Hellnotes, a weekly newsletter for writers of dark fiction). She also edited the electronic anthology Stones. Her stories have appeared in Masques V, Spells of the City, Pandora’s Closet, Furry Fantastic, Dreaming of Angels, Extremes V, and Cemetery Dance magazine. Forthcoming are stories in All-American Horror and Shadows of the New Sun. According to her website, Judi makes her home in tornado vulnerable, flood-prone, and earthquake-shaken Southern Indiana. Tell us how you first encountered Gene’s writing? It might come as a shock and surprise to those who have enjoyed the delicious worlds and deft prose and poetry of Gene Wolfe all these many years, but every day opens the possibilities to new readers. I know because in 2002, I became one of those newbies. That year I was the publicity coordinator for the World Horror Convention in Chicago, and Gene was one of the Guests of Honor. Honestly, I knew nothing about his writing except that one of my good friends spoke highly of his books (and said friend owned and had read every single one of them multiple times). Fair enough. 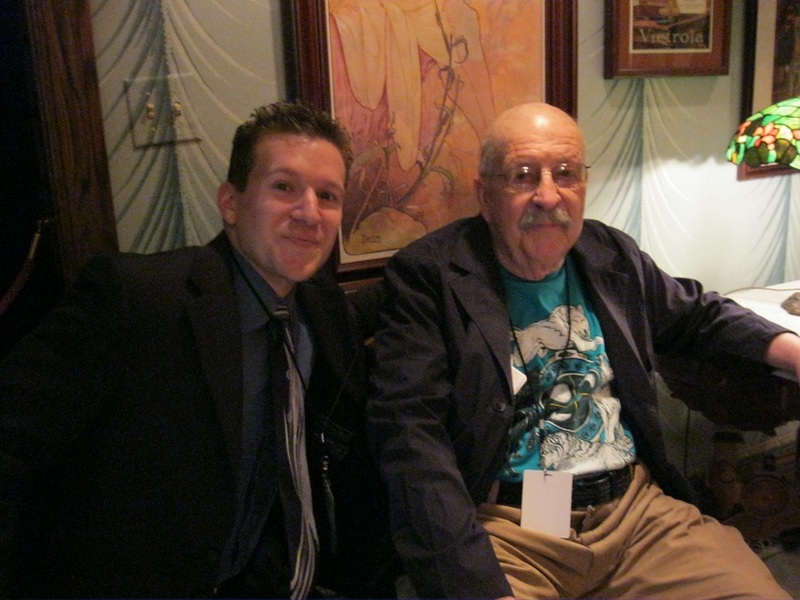 I dove right in, pinged Mr. Gene Wolfe via email, introduced myself and function, and requested an interview. He said he’d already done enough interviews – people were tired of hearing about him. Please understand he was never curt or rude, just, well, challenging. So I backed up and punted. That’s what I told him. I said I needed to publicize his attendance at the convention, but I wanted to engage him in something fun. So he insisted on interviewing me, and I wound up writing about the back-and-forth. By the time the convention was over, we (including his lovely wife, Rosemary, and my husband and daughters) were friends. And I had learned to think in a whole different way. He’s not just deep in print, let me tell you. Tell us about your favourite story or novel by Gene and what it means to you. This is a hard question to answer. It’s akin to asking what’s my favorite kind of cheesecake. But I’ll give it a go. I don’t think there is a better short story writer, so I love his collections. Starwater Strains especially. But whenever I come across one of Gene’s short stories in a magazine or anthology, I have to read it first. He absolutely nails just how long the story should be. Heck, the crafty devil managed to include a brief tale in the introduction he wrote for Brian A. Hopkins’ new collection, Phoenix. I don’t know anybody else who could pull that off. As for novels, Pirate Freedom is hands down my favorite and not because he dedicated it in part to my younger daughter, Bekah (known to Gene as the Li’l Pirate). When I finished that book, I turned around and read it all over again. Captain/Father Chris truly snagged my heart and managed to drag me into the fray all over again. Gene does that, though, all too easily. Most often it’s because Wolfe worlds involve numerous dimensions and layers. Reading any of his books or short stories just once can’t possibly provide any reader with the full force and impact. His tales are like those Russian Matryoshka nesting dolls. There’s more and more and more and . . .
Home Fires is like that, too: It’s Science Fiction! It’s a mystery! It’s a thriller! I totally enjoyed peeling away those layers. The first time I heard Neil Gaiman talk about Gene’s writing, he said he’d read Peace and then turned around and read it again because he didn’t know until the end that there was so very much in that story. I’d already read Home Fires three times when the editor called me about the anthology. That was the world I wanted to explore more fully, so I reread it twice more. But Peace does hold a special place in my heart. What is it about Gene and his work that has inspired you and so many other writers and readers? He spins one heck of story. I don’t know anybody else who writes like he does. His words grab me by my collar, whoosh me into whatever world he’s created, and fold me into his story immediately. There’s no warm-up. No hesitation. Just here it is and here’s what’s happening. I haven’t figured out how he does it. Maybe I really don’t want to know, and I’m a writer who reads the end to mysteries, not to kill the suspense, but because I want to see how the writer gets to that end. I don’t do that with Gene’s works though. I plunk my keister down with my dictionary and open all my senses. I think it’s a lot like savoring twenty-year-old fine Kentucky bourbon. I sip; I consider; I marvel. And in the end, I feel mighty fine! But there is more to Gene Wolfe than his writings. I have the extreme privilege of knowing Gene as a person. Our emails and letters and conversations generally revolve around our families and things in the world other than writing. Lots of silly things. Silly songs. Poems. Remembering things from our pasts. And yet having swept away his writings, I have to say his Letters Home, a collection of his correspondence with his family when he served in the Korean War, is the one book I treasure most. Li’l Pirate is now older and married to a Marine. Gene’s letters have helped me to understand a bit of what my son-in-law must be feeling being so far from his family. I try to read something from it right before I go to bed at night. Your story in Shadows, “Tunes from Limbo, But I Digress” is related to Gene’s novel Home Fires. What was it about this recent book that inspired you? Can you tell us how you came up with the story? My tribute in the book touches a bit on explaining this. I came up with that title a long time ago. Gene told me then I better hurry up and write a story to go with it or he was going to steal it. But no matter what I wrote, no story of mine seemed to be the right fit. Then when the editor called and said Gene requested a story from me for the book, lots of things suddenly fell together: Home Fires; a comment Gene made about pencils and my obsession with Palomino Blackwing 602s; his many stories where he wrestles with memory; Mark Roth’s TED talk about suspended animation. And once I got out of the way of the narrator, lots of other things popped up. Storytelling is always a surprise. It’s part of the fun of writing. But besides wanting to tromp around in a Gene Wolfe world, I also wanted to write a story for Gene and Rosemary, so there are things in the story that only Gene will understand. Names he will recognize. Lines from poems we shared. I knew from the beginning the story would begin with “Dear—.” I mean how many of Gene’s stories begin just like that? And I said I was a junkie for his letters. “Tunes . . .” is my letter home. Gene Wolfe forced me onto a spaceship bound for who knew where. It was fun finding out. There has never been a story that I have worked on harder or have sweated over more because how do you pay homage to a man like Gene? As long as he likes the story that’s all I care about. Home Fires is another of Gene’s tricksy books. I was astonished that you felt safe to write a related story. Were you at all worried that you hadn’t “got” the story beneath *Home Fires*’s surface (because I would be terrified)? But your story oozes confidence as it builds on the novel’s foundations. I am curious to know how you felt about it? Thanks for those kind words. They truly mean a lot. Yes, the pressure at first was daunting, but that spring when I first met Gene, he asked that I be one of the speakers at his tribute luncheon. At that time I had read very few of his works, but I agreed. (I mean, what an honor!) I talked about how bowled over I was with his writing. How he was like drinking champagne in a paper cup. Or was it beer in Waterford crystal? The point was I was a new reader. Brand-spanking new! Gene Wolfe as a writer is all about being brand-spanking new. He grows as a writer with every new project. He keeps his eyes and ears open, his imagination cranked up to high. Maybe that’s the most important thing to take away from Gene Wolfe as a writer. He forgets the stuff that came before and embraces the possibilities of the future. The man is ageless, and some people need to catch up. Nancy Kress is the author of 26 books, including the classic Beggars in Spain, which won the Hugo and Nebula awards for best novella in 1991. Last month she deservedly won a 2013 Nebula award for her novella After the Fall, Before the Fall, During the Fall (Tachyon Publications). Nancy also teaches at Clarion and other writing festivals and is the author of several books on writing. You can find out more on her website. You’ve known Gene a long time, but how did you originally come across him? Did you encounter the man or his writing first? I first read Gene when “The Island of Dr. Death And Other Stories” appeared in 1970. I was enchanted. By 1980, when The Shadow of the Torturer was released, I was a firm fan. At that time I was teaching at the State University of New York at Brockport, and the English Department was running a week-long summer writing workshop in various genres: poetry, fiction, journalism, science fiction. Each faculty member (I was adjunct faculty at the college) was asked to invite one co-teacher, and I was astonished and delighted when Gene accepted. We hadn’t met before, and I was an unknown, having published only a handful of stories. Gene stayed at my house for the week, and we had plenty of time to schmooze. During that workshop, my young son broke his arm at Day Care and I rushed him to the ER. That happened to be the same night I had invited all our students, plus some faculty, to dinner. So I’m calling from the hospital to Gene: “Could you please put the ham in the oven at 325 degrees?” And later, “Do you think you could get my big pot from the lower left-hand cupboard by the stove, fill it with water, and set it boiling for the corn?” Later: “Gene–do you know how to shuck corn?” Gene did it all, and both the kid and the dinner were fine. My favorite is “The Island of Dr. Death and Other Stories,” which is why I leapt at the chance to add to the story for the Gene Wolfe tribute anthology. I loved it for two reasons. That little boy is so appealing, so clueless as to what is happening in his household, and so real. Creating a character that memorable in such a short space is not easy. Second, I was exactly that kind of child, bringing the characters from my favorite books into my “real” life—at least, in my mind. Gene wrote a memorable introduction to your first collection back in 1985 (and it is reprinted in Castle of Days). If you were to introduce Gene, what would you try to say? I would say that this is the science fiction writer that other SF writers aspire—or should aspire—to be. Incidentally, I am still touched and proud of that introduction he wrote for my first collection. There’s also an extract from a letter to you in Castle of Days. Does Gene always write such wonderful letters? Yes. We used to correspond regularly. Somehow when the Internet appeared and both our lives got much more complicated, we stopped doing that. It’s a shame, really. How did you get involved in the Shadows of the New Sun collection? I was thrilled to be asked to contribute a story. Some of the stories in Shadows of the New Sun play with Wolfean conceits and themes or re-examine earlier stories, but yours, “… And Other Stories” takes this process to a new level. Can you tell us the origin of the story? I can’t ever identify the origin of any of my stories. I did know that I wanted to somehow use “The Island of Dr. Death and Other Stories”, and so I reread it. And immediately my story popped into my head. There are gift stories, that come to you whole, and this was one. Although, of course, they’re not really unearned “gifts”—they come from years of unconscious fermenting of ideas, emotions, other authors’ work, daily experiences, imagined experiences, and everything else that roils away in the bottom of writers’ souls. What is it about Gene and his work that has inspired so many other writers and readers? Its complexity and simplicity combined. The complexity is in the ideas, the plots, and the wonderful language. The simplicity comes in the characters’ desires. You are always clear what Tackie or Severian or Candy Garth need, and their humanity leads you through their sometimes convoluted plots. 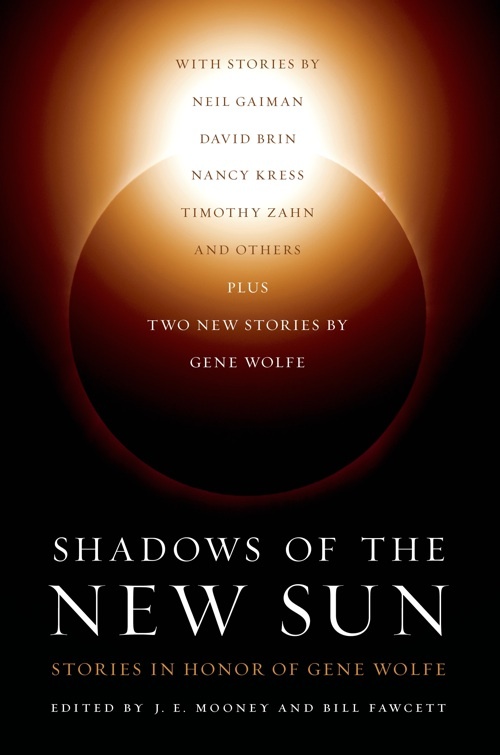 This August Tor will publish Shadows of the New Sun: Stories in Honor of Gene Wolfe. We have a copy here at the library, which Jonathan is poring over at the moment. Amongst the celebrated contributors like Neil Gaiman, David Brin and Nancy Kress, we spotted the name of Marc Aramini, a regular contributor to the Urth email discussion list, and soon to be a contributor to Ultan’s Library. Hi Marc, would you mind introducing yourself to the readers of Ultan’s Library? I live in Kingman, Arizona. I have an undergraduate degree in Biochemistry from the University of Notre Dame, but realizing that my temperament is ill-suited to long hours of lab research, I decided to have fun and finished my Masters in English Literature from Northern Arizona University. I have spent much of my adult life in the corporate world, after one year of simultaneously teaching high school Biology and college English Composition. For the past two years I have been back teaching at the college level. I have been writing fiction for about eleven years, but with very little publication success. Until now. Tell us about how you first encountered the fiction of Gene Wolfe. I read science fiction and fantasy quite a bit as a young child – by the fourth grade I was reading Asimov and Zelazny (must have been starting at both ends of the bookstore shelf). My father’s friend gave me a whole box of SF books in 1988 or so from the Science Fiction Book Club, and one of the volumes was The Claw of the Conciliator. I had to find the other volumes in used bookstores or the library, but it quickly became one of my favorites. I think in the sixth grade a questionnaire at school asked what our favorite book was, and I wrote, for shock value, The Shadow of the Torturer, then resolved to go home to reread it. At that point I realized exactly how subtle and sublime Wolfe was, and time turned my “shocking” answer into definitive truth. My mother was in the Air Force, and though I have two older half sisters, I was raised as an only child, moving quite a bit in my childhood. Those books were more consistent and real to me than the people who came and went so often; they were the friends I never had to leave behind, the voices speaking in the silence of night. Tell us about your favourite of Gene’s work, and what it means to you. The Book of the Short Sun is definitely my favorite – I remember reading On Blue’s Waters in my senior year in college and just savoring it chapter by chapter. I have never been more rewarded from rereading a book – and it was really the first time I knew that “my” interpretation of the text was wholly and completely my own. There’s a lot of figuring out to be done in a Wolfe story, and that is the first time it all came together in such a way that I could point to a page and tell you – here – our narrator is Horn; here – he is Silk. I could tell you why, as well, but I won’t do that now. Having said that, I really do love almost everything he has written. “The Changeling” (collected in Castle of Days) has a similar special place in my heart. How did you get involved with the Shadows of the New Sun collection? Way back in college, I found a database with authors’ mailing addresses. Of course, the only one I was interested in was Gene’s, and I wrote him a fan letter. To my surprise, he actually answered my letter, and we have corresponded for probably the last thirteen years, our letters becoming less about his work and more like those exchanged by friends. It is amazing to me that a childhood hero would take the time and effort to get to know a fan. He let me know that there were plans to do a tribute anthology, using his creations as jumping off points, and I asked for the editor’s email (to crash the party uninvited, of course). Thankfully for me, Gene obliged (and he also let me know the editor liked dogs – so I made sure to include Cautus from Soldier of Sidon in the story). How excited are you that one of your first publications is in a tribute to Gene Wolfe AND in the company of so many noted authors? Even though I have tried to get published unsuccessfully on and off for over a decade, more than being a writer, I am a Wolfe fan, and I have read his work with such care and devotion that I feel that this is the kind of project I am well suited to. Being in print with Gaiman, Swanwick, Nancy Kress, Brin, Haldeman, and so many other truly great writers is a wonderful feeling (and of course, Wolfe is under the cover as well!). I have read, pondered, and reread almost everything fictional Gene has written. I feel that about ten of my old stories and my first two novels are more or less publishable, so I’m tweaking them a bit to see if any will sell. I try to make everything different – some are highly stylized, some are overtly science fictional. Most of them seem pretty realistic, but they are all at the very least fantasy – my few readers have said my weirdest stuff is the autobiographical writing – go figure. I have two half-finished novels and about five short story ideas floating around in my head. One of the unfinished novels is sort of a homage to St Peter, Godzilla, and Death’s Head with a destitute future eugenic Chinese setting. The other is a historical Japanese fantasy set at the time of the Tale of Genji where the main character is a terrible poet and a cultural outlier, and when they find his younger brother’s tattooed arm in a tree, everyone suspects him of fratricide. My mother liked the first novel I wrote and said the second was unreadable and too complicated, but I rather think it is the best thing I’ve written. My writing process is a bit bizarre – I can’t write every day, and I can’t write sequentially, so when the inspiration hits me I will write 5,000 or 10,000 words at a time, choosing the scenes I want to write, and then rearrange them later. The final step is writing bridging material. Perhaps some day I will become more reliable and mature in my method. I might write 70,000 words in a week and then not write for a year. I am satisfied that my Wolfe tribute is seeing the light of day in this collection, regardless of whether or not anything else gets published. Tell us how your story, “Soldier of Mercy”, relates to Wolfe’s Latro novels. I have always wished that the Soldier series sold well enough for Wolfe to definitively finish it as he had originally planned, because I think it is every bit as important and great as more celebrated works such as The Book of the New Sun and The Fifth Head of Cerberus. Except for a few very notable exceptions, his endings are often melancholy, and I have always wondered where and on what note Latro’s wanderings would end. The first novel has one of the most sublimely ironic and finest endings in literature – our amnesiac narrator finally locates someone who knows him, dying there on the battlefield, and he can only give comfort. The long wait for Soldier of Sidon produced an ending that is far less than triumphant, and even less conclusive than Soldier of Arete, leaving Latro to look for his sword (perhaps fruitlessly?) and his destiny. In that regard, I wanted to definitely place my story as a possible ending in a philosophically high stakes struggle that fit the theme of Latro’s character progression. However, if this is contradicted by anything Wolfe decides to write, I also wanted to factor this difference into the frame tale, to be able to “explain it away”. So “Soldier of Mercy” is set some time after the end of Soldier of Sidon, but depending on the reader’s take on the frame tale, it doesn’t have to be a part of Latro’s canon at all. If I could, I would like to talk here about some of the features of the Latro stories. I have always believed that Wolfe is a modernist who merely pretends to create inconclusive subjectivity; his elided structures point at “correct” conclusions that are often implied. Sometimes this is indeed thematic. In the first two Soldier books, I was certain that Latro’s sensibilities were developing away from bloodshed. Too many deaths, such as the murder of the slaves at the hands of the Spartans in the manumission ceremony in Soldier of Arete, and the death of his Amazon lover, have created a soldier weary of war. What other option does he have in the pre-Christian world? There are even scenes in Soldier of Arete where Latro is actually called by the name Pleistorus, (“A name under which the War God is worshiped in Thrace”, according to the Glossary at the end of Soldier of Arete). Readers can explore for themselves the relationship posited between Ares, Pleistorus, and Ahura Mazda in Soldier of Arete. It is very enlightening. Latro wins combat like the Olympic competition at the end of Soldier of Arete, unless instructed to “throw the match”. He pushes the boulder of Sisyphus up the hill when Sisyphus can’t do it, though Sisyphus is a demigod. Nike or some victory follows him around, though always at his back. He is a gateway for the gods: they are unreal to others until he touches them. Latro falls for an Amazon girl, and the Amazons are called “daughters of Ares”. The traditional enemy of Ares is the boar, and Latro flushes him out. And Latro makes love to Aphrodite, in some stories the wife of Ares, but also the goddess of love, not war. Fell Ares quits the spear-proud throng. In this culminating poem, Ares is tired of war and leaves it behind, or at least this particular conflict: he has quit the warmongering crowd. I feel this is vital to understanding the Soldier series and Latro’s character progression, and I tried to show the end of this transformation. There is one more subtext I wanted to explore: the tension between the Achaeans, the Dorians, and the Romans. In the original books, the Achaeans have been replaced by the Dorians (Spartans), who have gained ascendance. If I’m not mistaken, this angers the ghost of Achilles, and he wants the Spartans to be vanquished. Thus I wanted to place a Dacian or Getae presence in Rome to continue that particular line of tension. Something must rise in every power vacuum, and in my mind Latro represents the burgeoning triumph of Rome that looms over all Greece (he is the seed of Rome, as has been said). I have made more definitive conclusions about those struggles and Latro’s identity on the Urth list, but I feel this encapsulates many of the wonderful conflicts lurking in the backdrop of the Soldier series. How difficult was it to write in that voice? Can you tell us about the challenges of writing this way? There was a reason I selected Latro as a first person narrator, and not Severian, Weer, Horn, Marsch, or the casuist Father Chris. Of all Wolfe’s characters, Latro is the one who will almost invariably act according to sound moral judgments. It is not Latro who can’t be trusted, it is his perceptions of the world. Severian might jump in to save a child, or he might stand back and claim that he was suddenly overcome with fear. Weer might or might not bury someone who tried to steal from him. Of all Wolfe’s characters, Latro is the one who looks at the facts he has and tries to act justly. The progression of his character in the first two novels (a bit different than in the third, after the passage of so much time between their composition) made him a being of action who is slowly but surely becoming weary of killing, but who still believes in right and wrong. He is unreliable only insofar as people try to use his lack of memory against him, turning his blade to their purposes. One of Wolfe’s most primitive characters behaves more nobly than the Catholic priest who narrates Pirate Freedom – why? Wolfe is not a naturalist: environment is only the excuse Father Chris uses, as Latro proves. Having said that, I am not the artist Wolfe is, and I am sure Latro’s voice is a bit off, though I tried my best to actually portray his simple nobility and the mystery of the ancient spiritual world. It was more difficult to decide what to call the various gods and places, for Wolfe’s knowledge of history, ancient languages, and culture is far superior to mine. Thus sometimes I opted for Greek names, divinities, and words, especially when the character Isokrates was concerned. What aspects of Gene’s writings did you try to capture in your story? I feel like the themes of memory, identity, free will and salvation are always lurking in Wolfe’s fiction, and I think my story plays with these themes as well. Whether or not it actually evokes Wolfe will be up to the readers. While I think my writing can often be intellectual, I am still not entirely confident concerning the aspects that actually make it readable. Indeed, the sum total of input I have received on my writing before this is just a plethora of form rejection letters. Perhaps we should end this with the dominant metaphor: hopefully my style succeeds in being at least a pale shadow of a Wolfe.